SAN ANTONIO -- In a highly competitive NBA in which no more than 450 jobs exist and every game is supposed to be the biggest one since the last, few players exhibit a laissez-faire attitude on the same level as San Antonio Spurs forward Boris Diaw. You're as likely to get a shrug of the shoulders in an answer from Diaw during postgame interviews as you are to get an "umm" or "you know" from any other player. During an 82-game regular season in which the Spurs missing the playoffs is a bigger stretch than contending for the title, the ability to shrug it off and move on to the next moment is an advantage for San Antonio. After getting torched by Kevin Love for 42 points on 15-for-27 shooting from the floor, including 8-for-9 from 3-point range, and 14 rebounds in a Dec. 13 win over the Timberwolves, Diaw, Matt Bonner and the Spurs held Love in check in a 104-86 victory on Sunday night in San Antonio. 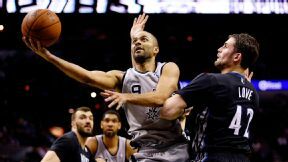 Soobum Im/USA TODAY Sports Tony Parker wasn't the Frenchman that troubled Kevin Love the most on Sunday. The Spurs fronted Love in the post and chased him off the pick-and-pops he feasted on a month ago, limiting the Minnesota big man to 14 points on an abysmal 3-for-14 shooting from the floor. "We just stayed with him at all times," Diaw said, undercutting what was a focused and workman-like effort in defending the league's fourth-leading scorer. Any time Love touched the ball for more than a fraction of a second, the Spurs had multiple bodies on site, one bodying Love up and others putting hands in his eye line and dribbling lanes. You could count on one hand the number of times that the Timberwolves' big man had a clean look at the basket. And when Love got rid of the ball, his teammates were unable to hit the shots that might make the Spurs think twice about double-teaming. Minnesota shot 35 percent from the floor and had Nikola Pekovic not converted 10 of his 15 shots around the rim, the numbers would've been even worse. "They were very physical with Kevin Love everywhere he moved," Timberwolves coach Rick Adelman said after the game. Diaw was thrust into the role of guy-tasked-with-defending-the-undefendable thanks in part to an injury to the Spurs' front line. When Love went off for 42 points last month, it was Tim Duncan chasing Love out to the 3-point line as every pick-and-pop Minnesota ran seemed to result in an open shot on the perimeter. But with Tiago Splitter out for the next three to five weeks with a shoulder sprain, Diaw picked up both the start and assignment, and Duncan slid over to battle inside with Pekovic. The personnel change led to more of an emphasis to get the ball down low to Love, with poor results. Offensively, Diaw and Bonner's ability to cause the same problems out on the perimeter that Love typically does forced him to defend on the other end. That Bonner alone matched Love's point total on four fewer shots indicates just how well San Antonio defended the Wolves' big man. "It's easy if I get them right when I come in and I'm not hyperventilating from lack of oxygen," Bonner said of his ability to hit shots immediately after coming in off the bench. "I'm a recipient, I spot up and spread the court and this is just a night where I was left open." Just nights after leading the charge to hold Dirk Nowitzki to a similar 3-for-14 shooting night in a win over Dallas, Diaw got the lion's share of the credit for frustrating Love. Diaw defends some of the NBA's best scoring big men with results far beyond what expectations of his unconventional physique suggest. Ask him about it and you'll get a standard Diaw response. It usually starts with a shrug. Andrew McNeill writes about the Spurs on 48 Minutes Of Hell, part of the TrueHoop Network. MVP: Mike Conley carried the Grizzlies down the stretch, buoying the offense with six assists in the fourth quarter to go with eight points. He finished the game with 21 points, 13 assists and four steals. X Factor: Zach Randolph feasted on Atlanta's depleted front court, especially with Paul Millsap in foul trouble. Memphis finished the game with an eight-point advantage in second-chance points and from inside the paint. Defining moment: The Grizzlies retained control for the majority of the game. But the Hawks, thanks to a steady dose of 3-pointers, were constantly at their heels. With four minutes to go and the Hawks within five points, Mike Miller nailed two 3-pointers in a row and iced the game for Memphis. MVP: Isaiah Thomas was a terror for the opposing Cavaliers, getting to the line 11 times and making 10 of his free throws en route to a superb 26-point, 4-rebound, 6-assist and 2-steal line and a convincing victory. LVP: Kyrie Irving was a major disappointment, shooting 3-for-14 from the field to finish a minus-29 scoring just seven points, while allowing Thomas to have a field day playing against his lackluster defense. X factor: Rudy Gay has been playing improved basketball since being traded to the Kings, and Sunday night was no different. Gay was uber-efficient, scoring 20 points on 8-for-12 shooting from the field. MVP: Tim Duncan had trouble guarding the massive Nikola Pekovic. Still, Duncan protected the rim from everyone else, recording four blocks to go with a solid offensive game (15 points, 8 rebounds and 5 assists). LVP: Everyone on the Wolves' starting unit except Pekovic had serious trouble generating offense. The other four starters shot 9-for-39 for just 29 points (a dreadful 23 percent). Pek was 10-for-15 and scored 22 points by himself. X factor: With Tiago Splitter and Manu Ginobili out, the Spurs were depleted, but their bench stepped up: All their reserves (except Cory Joseph) shot 50 percent or better, putting the starters in great position to throw the final haymaker. Isaiah Thomas, Kings: Thomas scored 26 points and dished six dimes as the Kings won their third straight game with this season's biggest rout, a 124-80 victory over the Cavs. The Cavs actually led 32-30 after one quarter before proceeding to lose by 44. Irving had seven points in the 44-point loss to the Kings. Irving also shot 3-for-14 from the field on the second game of a five-game West trip. The Luol Deng era is now 1-1.
he who sacrifices his beard for a woman, deserves neither. "Winning cures a lot of things." -- Kings guard Isaiah Thomas, whose team has won three straight and moved into a virtual tie with the Lakers in the West standings. 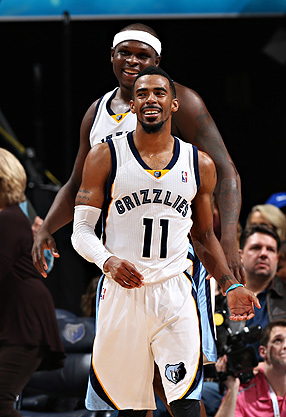 Joe Murphy/NBAE/Getty Images Mike Conley had 21 points and 13 assists in a 108-101 victory over the Atlanta Hawks. The Memphis Grizzlies' point guard is averaging 26.3 points in his past three games. Zach Randolph scored 18 points and led all players with 12 rebounds in the Grizzlies' 108-101 win over the Hawks. That was Randolph's 11th "double-dozen" in 19 games since he returned in early December from an ingrown toenail. He is tied with Kevin Love for the most double-dozens in the NBA during that time.